For LiveYoga Wellness owner Teri Roseman, yoga isn’t just a fad or an exercise, it’s a way of life for the self-described yogi that she is eager to share with her clients and neighbors at her Westchester studio. This May will mark the yoga studio’s fifth anniversary and Roseman’s own journey to find meaning in her life through the practice of yoga. Although she has practiced yoga on and off since the 1980s, a difficult year filled with a relationship ending, her father passing away and a diagnosis of breast cancer brought her back to practicing full-time and earning a yoga teacher training certificate. After being laid off from a high-powered sales position in the corporate world the day before starting a Yoga Therapy Program at Loyola Marymount University, Roseman knew something had to change. 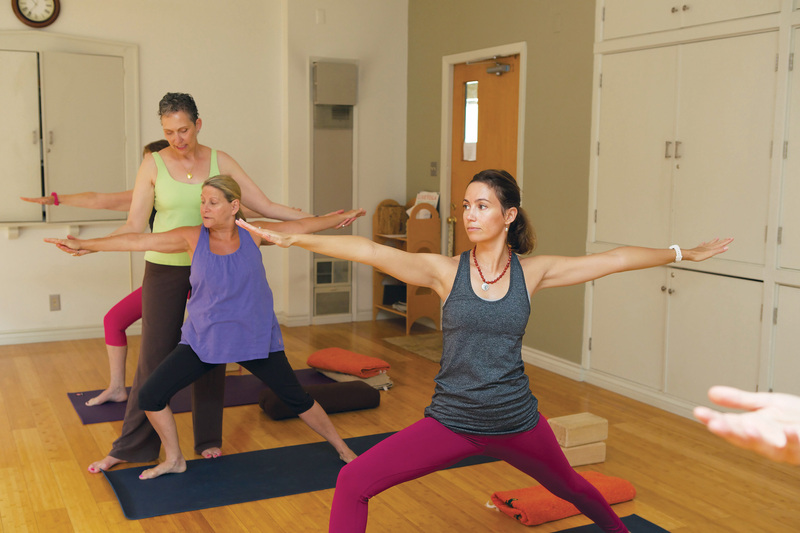 When a friend casually mentioned that a room at Holy Nativity Church was being remodeled into a yoga studio, Roseman met with their pastor, Peter Rood, without expectation to inquire about the space. The two quickly decided that the timing on the meeting was “meant to be” and settled on an arrangement for her to lease the space. She’s been using that room with soft light, good air circulation and a calming atmosphere ever since. As a yoga therapist, Roseman says she uses yoga tools and philosophy with an understanding of the Western medical model to work with someone holistically. After a consultation and questionnaire she can help assess what yoga might be beneficial to her clients. Roseman explains that the strength in yoga lies in people’s individual practice and the ongoing journey they experience. She is quick to point out that everyone can do yoga, but not everyone can do every yoga type or position. Her goal, however, is to make yoga accessible to everyone in the room whether they need special modifications like chairs to sit on, props for correct alignment or help in achieving proper form. And over the years, Roseman has helped clients use the tools of breath, movement and meditation to find relief from chronic aches, old injuries and chronic health conditions, like complications from diabetes or Parkinson’s disease. For Westchester resident Mary Ann Bell, who started off as a client and now works as the studio’s manager, finding yoga has brought purpose to her life after retiring from a physically and mentally challenging job and the economy forcing her to downsize her lifestyle. For Roseman, who is a proud breast cancer survivor, yoga has been a source of centering and balance that has led her to keep focusing on the positive and what’s important in life in a world where we’re programmed to focus on materialism. She’s made it her mission to help share what she’s learned through the practice of yoga to the community that’s been created through LiveYoga Wellness. Through January 15, Roseman is offering a “gratitude offering” to the community where anyone can take a free class that she teaches to experience yoga for themselves. She also offers two community classes a week on Tuesdays at noon and Thursdays at 1:30 p.m. for a suggested goodwill offering of $5. LiveYoga Wellness is located at 6700 W. 83rd Street (entrance on Dunbarton) in Westchester. For more information, please visit liveyogawellness.com.